Internship! It’s a perfect choice for those of you that want to gain more professional experience. I hope the two job fairs in March were helpful for those of you who are looking for a summer internship. If you missed them, it’s okay. Hire@TU is still a valuable resource for job-hunting TU students. 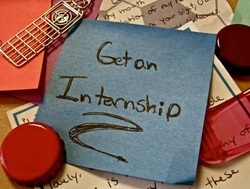 Not only are internship positions posted in Hire@TU, but there are plenty of full-time, part-time and even on-campus jobs. For more help, you can make an appointment with an advisor in the Career Center located in the 7800 York Road building. For those of you seeking to graduate early, Towson is open for summer trimester. There is a variety of classes, which range from general education to electives to courses for your major. You also can choose the length of the courses, which could be five-weeks, seven-weeks, and ten-weeks. Sign up Today! If you want to have a relaxing summer, traveling may be your choice. Either plan a vacation with friends, family, or look into studying abroad! Give yourself a chance to visit your favorite destination before graduation since the stress of getting a full-time job to pay off your student loans probably won’t allow you to travel a lot. It could be the most memorable vaction in your college life. If none of the aforementioned are an option for you, you can always fall back on REST. Enjoy the summer without having school work, catch up on those eight hours of sleep, or hang out with your friends. Now, are YOU ready for summer?